A look at the net worth of one of the world's richest men, and the traits that influence how he continues to build his fortune. Source: TechCrunch under Creative Commons license. Born in 1984, millennial Mark Zuckerberg is one of the wealthiest people on the planet. At the time of this writing, his fortune is estimated at $40.7 billion, which, according to the Bloomberg Billionaires index, makes him the eighth richest person in the world. Where does Zuckerberg's wealth come from? Zuckerberg's wealth derives from Facebook (NASDAQ:FB), the social-networking site he started while still a student at Harvard University. According to Facebook's most recent proxy report, Zuckerberg owns nearly 4 million Class "A" shares and 471 million Class "B" shares, for a total of 475 million shares, which would make up nearly all of his fortune, as estimated by Bloomberg. 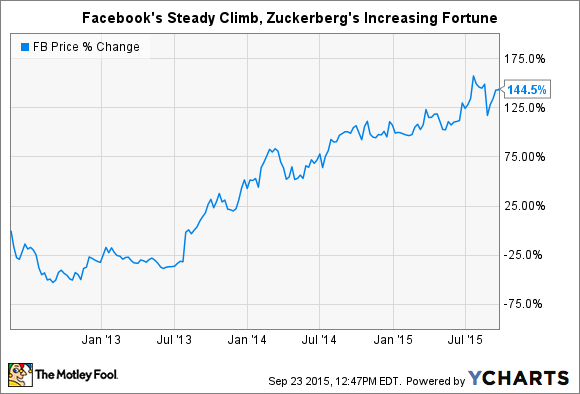 Is Zuckerberg's wealth growing, or in decline? Zuckerberg is noted for having donated, along with wife Priscilla Chang, a massive 18 million shares of Facebook stock to Silicon Valley Community Foundation in 2012, and again in 2013. The 36 million-share gift, worth nearly $1 billion in sum when valued at the time of each donation, is one of the largest charitable contributions on record. What lessons can we draw from Zuckerberg's success? Oculus Rift at Gamescon image by Marco Verch under Creative Commons license. One of our fascinations with wealth, and billionaires in particular, is understanding the mechanisms by which immense prosperity comes about. For Zuckerberg, the creation, rise, and perpetuation of Facebook, which today has a market capitalization of over a quarter of a trillion dollars, can be traced to the founder's penchant for taking outsized, concentrated business bets. Certainly, we can say that most successful entrepreneurs engage in immense risks that often arise as "bet the farm" propositions. But what's interesting about Zuckerberg is his continued willingness to marshal enormous resources to invest in future growth, despite now managing a stable, extremely profitable company. Facebook's acquisitions last year of mobile messaging service WhatsApp and virtual-reality technology pioneer Ocuclus VR demonstrate the extent of both Zuckerberg's vision and his extreme risk tolerance. WhatsApp lost $138 million in the year before acquisition, yet Facebook paid a total of nearly $22 billion in cash and stock for the company, placing a premium not on its business model, but on the 450 million users it boasted at the time of acquisition. Facebook purchased Oculus VR, maker of the Oculus Rift virtual-reality headset, for nearly $2 billion in 2014, though its flagship product is still in development. In this case, Facebook's management team invested in the promise of a technology that Zuckerberg has described as "the next major computing platform that will come after mobile." By most measures an extremely significant acquisition, the Oculus purchase looks small only in comparison to the WhatsApp deal. Together, these two transactions are equal to more than half of Facebook's entire current stockholders' equity. Yet neither will be "accretive" to Facebook's earnings for quite some time. Both are investments in future cash flows, and company management will have to execute with precision in order for the promised benefits to materialize. This aspect of Zuckerberg's business philosophy, to invest forcefully and decisively, is a trait that extends to his ideas on corporate governance. The entrepreneur famously controls a second class of company shares that concentrate decision-making in his hands, and ultimately makes negligible the power of common-stock shareholders to challenge decisions or company direction. Zuckerberg's desire to be effective, unconstrained in decision-making, and enabled to place huge bets on the future can be traced back to his letter to shareholders in Facebook's IPO registration document in February 2012. In that communication, Zuckerberg laid out five core values of how Facebook is run. Besides "Be Open," and "Build Social Value," three are quite fascinating in light of his post-IPO management. These values were listed in the letter as follows: "Focus on Impact," "Move Fast," and, of course, "Be Bold."